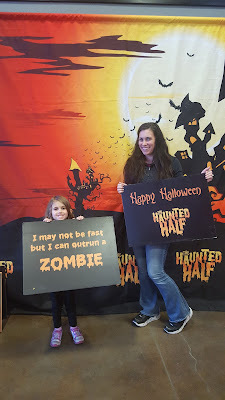 The Haunted Halfs were the races I was most looking forward to all year--the Haunted Half series. 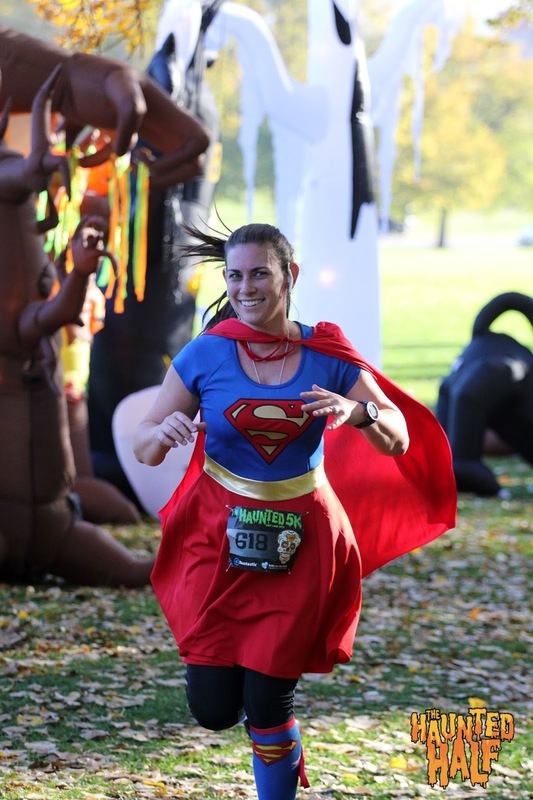 Combining Halloween, costumes, and running is just like mixing my favorite things together in one awesome event. And these races delivered! 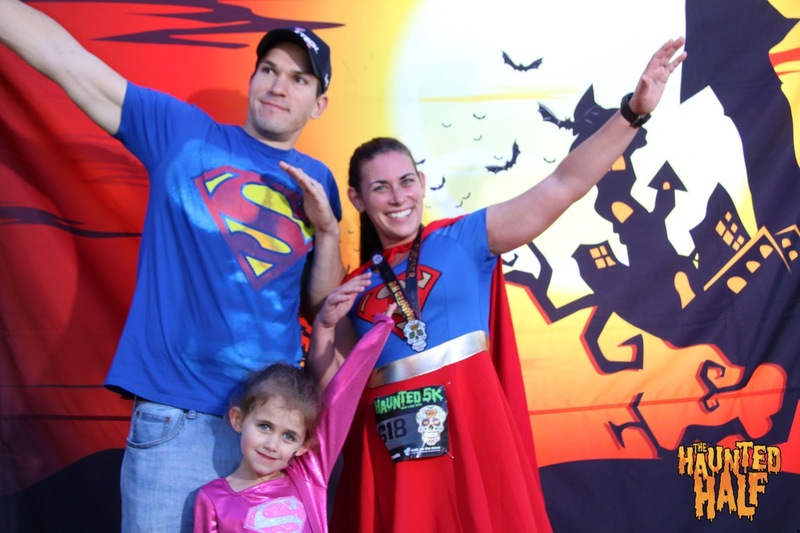 They were well organized, had great race swag and shirts, spooky music, decorations galore, and some pretty nice finisher bling. I signed up for both halfs, Salt Lake City and Provo, back in April. But, come race week for the first race, Salt Lake, I came down with a pretty nasty cold. Couple that with going six months before finally seeing my endocrinologist for my autoimmune disease, and I just couldn't physically do the race distance. So, I emailed the race director and they switched me to the 5K. I can always go at least 3 miles, so that was perfect. And that was a load off my back. The entrance to the race expo for packet pick-up was a giant inflatable pumpkin arch. All the expo booths (at both expos) had Halloween candy, so my daughter enjoyed going from booth to booth saying "trick-or-treat." There were plenty of photo booth opportunities, perfect for social media. My swag bag was filled with coupons to local businesses; free samples of soap, KT tape, and even shower wipes; Halloween temporary tattoos, Haunted Half gloves, and a super soft long sleeve Haunted Half shirt. I may actually still be wearing the shirt now. We were up bright and early for the SLC race, since we had about an hour drive to get there. 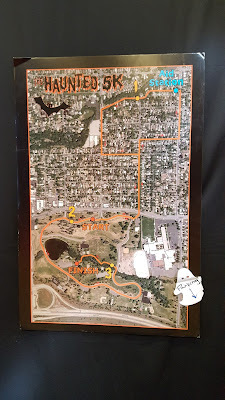 With the stress of trying to run a half marathon when I was feeling so sick now put at ease, I was feeling ready and pretty excited for this race. That excitement skyrocketed once we drove up to event parking and I saw all the decorations set up along the final mile of the race course. What can I say--Halloween decorations and Halloween music really puts me in the mood for a Halloween event. As a family, we all dressed up. I was super-woman, my husband was super-man, and our daughter was super-girl. Which made us the super-family, as many race runners and spectators pointed out. It was chilly that morning, so I layered with my Skirt Sports redemption knicks. 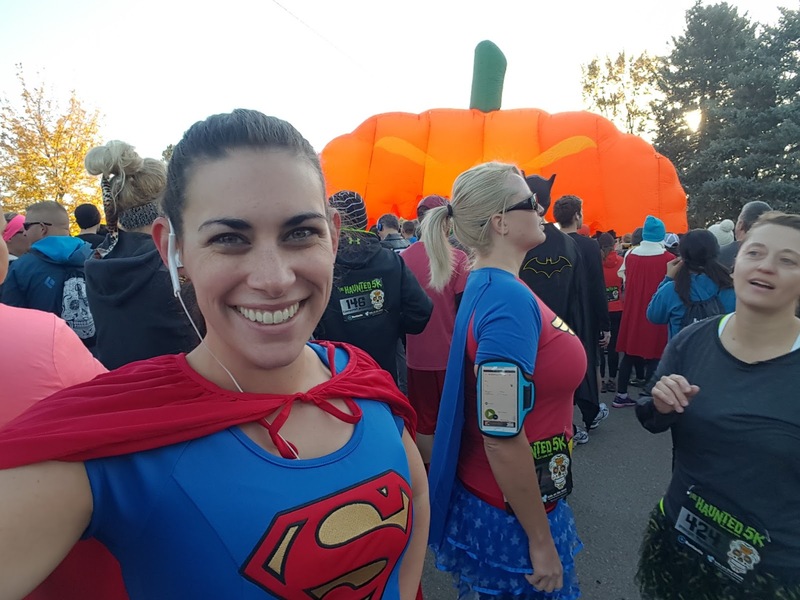 They worked great for this run, since I was still able to comfortably wear my super-girl socks (complete with cape) and I could stow my keys and phone in the pockets. I didn't want to layer with a long sleeve shirt since it was supposed to warm up, so I threw on my cape and hoped it would do the trick (it did!). 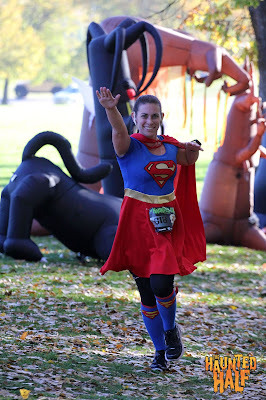 I was a bit nervous about running in a cape, but it actually worked out alright. It stayed over my shoulders the entire time, keeping me warm as I ran through the shadows. 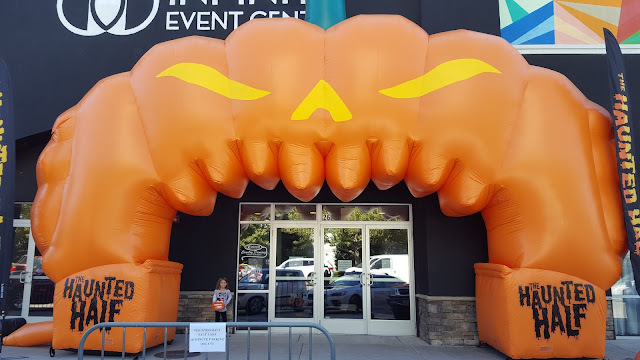 The starting line of the race was the exact inflatable pumpkin arch from the expo. By accident, we ended up waiting at the finish line, thinking it was the starting line. Once it got close to race time, I realized my mistake and had to book it about a quarter mile up a steep hill to the real starting line! What a warm-up, but at least I wasn't the only runner to make that mistake. I made it with two minutes to spare! Barely made it to the starting line in time! The race started to the tunes of traditional and modern Halloween music, and we were off. I ran in the midst of superheroes, monsters, ghosts, pirates, princesses, ninjas, and even a person dressed as a banana. This is one of my favorite things about costume races--seeing all the costumes! It was like being in a parade. The 5K course ran through a park and neighborhoods all decorated with tombstones, spiderwebs, skeletons, and ghosts. It was like all these houses were participating in the spirit of the race. There was a lot of uphill (which I'm definitely not used to being from the high plains of West Texas), but luckily it was on the way out, so the whole way back was a nice slope downward. As this was a fun run in my mind, I kept an easy pace and walked when I felt like I needed to. I still worked hard and pushed myself, but being ill, I didn't want to push myself too hard. Especially with a half marathon coming up the next weekend! The final mile was full of Halloween decorations! Halloween inflatables lined a portion of the course. A lot of them! Photographers were strategically placed in this area to capture the runners emerging from the dark forest. Then, there was a tunnel we needed to get through with black-light designs pained all along the sides. Spectators were lining the course from here-on-out and I easily spotted my super-family cheering for me as I turned the corner to the finish line pumpkin. I love how my husband is so supportive of my running. Not only supportive, but encouraging. He makes everything I love about races even more wonderful. And seeing them at the finish line is the best part of any race I run. I crossed the finish line with a not-too-shabby time of 36:56 and received my 5K finishers medal. And I felt great! The nice thing about 5K's is that they don't leave you super sore or stiff afterward, like the longer distance runs do. I was even feeling good enough to walk all around the zoo after we had lunch. Yes, still in costume. Like I said before, the 5K was a good choice for this first race of the Haunted Half series. 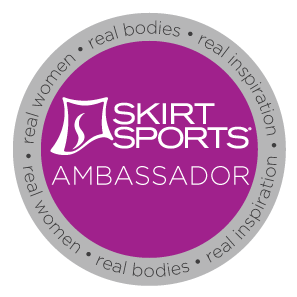 Runtastic events are some of the most fun, most well-organized races I've done...and I've done a lot! 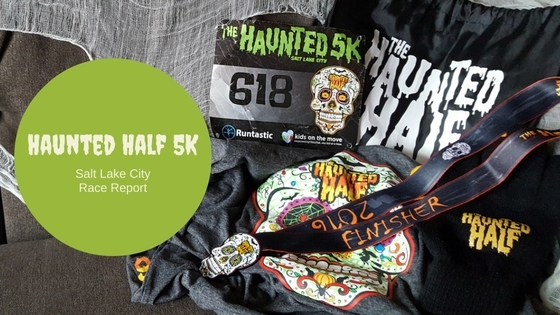 I'm sold on the series, and completing this race and Huntsville (another runtastic event), have left me excited to run the full Haunted Half in Provo.